Attack gravel, sand, mud and pavement! The DRX Ford Fiesta does it all, just like the real thing! Videos are of a different model, but it uses the same Chassis. The Kyosho DRX Readyset 1/9th scale 4WD WRC Rally car is a great kit for new and experienced RC hobbyist. This kit is extremely tough and durable as well as inexpensive to fix and simple to repair. 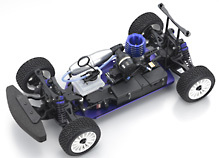 The Kyosho platform that the chassis is built from is well developed and has many hop up parts available from Kyosho as well. Ford continues its rally heritage as a World Champion with the S2000 and this RC Car inherits the DNA of the real cars. IRC held the FIA prescribes new (Intercontinental Rally Challenge) in order to challenge, announced in November 2009 is a machine which entered fiscal 2010. The Fiesta S2000 delivered an impressive victory at the 2010 Monte Carlo Rally, and the impressive performance continues! Now You can drive this car in scale form! Unbelievable realism can been experienced driving on surfaces such as dirt and gravel, Pavement and grass just like the real cars. In addition to dedicated R/C off-road courses, this machine attacks gravel, tarmac and any other surface with extreme confidence. The sweet resonating sound of the exhaust note signals the power of the Nitro engine that delivers the relentless drive of a true rally car. The precise dimensions of the long wheelbase chassis with 3-differential full-time 4WD produces the stable straight line performance and drift control that lets you transform any open space into a racing circuit for a driving experience like never before. With roll and tire squeal like the real machine and the finely detailed body, the world of rally car racing has never been closer than with the dramatic action of this dynamic model racer. 3 Differential Drive System - Long wheel base chassis with 3-differential full-time 4WD realizes the low center of gravity and excellent suspension for great running performance on any type of surface. 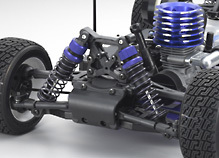 Fully Interchangeable - suspension arms and knuckles realize economical and efficient parts maintenance. Rock Guard - The design features rock guards that prevent dirt and stones getting inside and locking the wheels up unexpectedly. In the heat of racing battle, this is an essential design feature. Independent Suspension - Specially designed 4-wheel independent suspension delivers plenty of stroke even on the upward side for stable high-speed surface tracing and powerful running performance. Rally Pattern Tires - Rally pattern pneumatic rubber tires and wheels compliment the scale appearance of the body and its separate clear-lens headlights. Clear Headlight Lens - Separate clear lens headlights included add a detailed finish to the scale realistic body and decals. 2 Shoe Clutch System - Uses the same separated clutch structure as racing buggies to deliver superior throttle response. Large Capacity Air Filter - Large air cleaner works effectively to extend the maintenance cycle of the engine. No Holes - Downward facing offset of the muffler exit eliminates the need for exhaust holes in the body. Large Oil Filled Shocks - Large capacity oil shocks with chassis height adjustment function are included as standard. Keep the Dirt Out - Dirt resistant radio box can be completely removed with just four screws for easy maintenance. 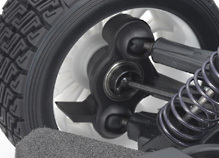 Dual Disk Brakes - Dual disk brakes allow individual brake settings on the front and rear. Large Fuel Tank - 103cc fuel tank delivers run times of more than 10 minutes. Racing Features - Racing design features include a transponder stay and a quick opening fuel tank cap. Unlimited Adjustments - Setting options are available for chassis height, camber, tread, as well as front and rear toe angle. Driven by the awesome power of the GXR18 engine fitted with recoil starter. 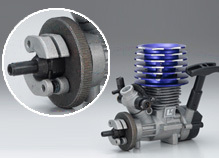 Separate-type clutch realizes great accelerator response. Long wheel base chassis with 3-differential full-time 4WD realizes the low center of gravity and excellent suspension for great running performance on any type of surface. Fully interchangeable suspension arms and knuckles realize economical and efficient parts maintenance. Specially designed 4-wheel independent suspension delivers plenty of stroke even on the upward side for stable high-speed surface tracing and powerful running performance. Knuckle design features rock guards that prevent dirt and stones getting inside and locking the wheels up unexpectedly. In the heat of racing battle, this is an essential design feature. Rally pattern pneumatic rubber tires and wheels compliment the scale appearance of the body and its separate clear-lens headlights.